The accordion door has been around for a long time. Folding doors, in fact, were created to offer a unique solution to spaces that needed an alternative to traditional doors. Since their creation, they have become much more than a functional tool, however, and they offer a lot of great options for high-end designs that are classic and creative, unlike anything you’ve seen before. Accordion folding doors are available in all kinds of styles and finishes, including exterior accordion doors that will accent the look of any outdoor living space. Exterior accordion doors are currently found in use all over in residential and commercial buildings. People put up folding doors to protect their cars in the carport, for example. These doors are also often used by bars and restaurants for patio access, allowing them to open up the entire space when weather permits and keep it warm and dry inside when it doesn’t. These doors are custom built for every installation, including a custom track system and recessed wall section to tuck away the doors when they are open. Exterior doors are great for patios and backyards. They combine the indoor and outdoor living spaces to give the home the more connected feel. Additionally, they are designed to withstand the elements and ensure that they provide years of enjoyment to the people who install them. Businesses and residential designers and contractors alike love the flexibility and style of modern accordion folding doors. Most people think of the typical closet doors, bathroom doors, room dividers, and other installments when they first think of accordion doors. However, exterior accordion doors are a great high-end addition to any home or business, and they offer many different benefits. The bridging of the indoor and outdoor living spaces is something that a lot of people enjoy, but it’s also a difficult design to pull off in many cases. 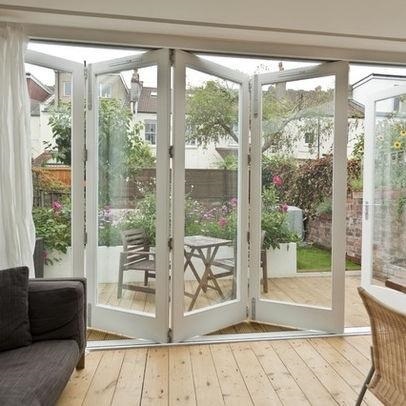 With the addition of these great folding doors, any design will come together and provide a stylish combination living space with flexible arrangement options. Exterior accordion doors are available in many different materials and styles, just like other folding doors. They can be custom-made from wood, glass, composite materials, and other materials as desired. They also include weather stripping and seals to ensure a tight fit, along with other protective features. After all, you can’t give up on function just because you want something that looks good. Modern folding doors are designed to work great and look even better, giving you peace of mind that you are getting the best. High-end designers and contractors are looking to these doors for inspiration, and they don’t have to look far to find it. They can feature glass panels, wood or fabric panels and accents, and more. Plus, each folding door comes with its own selection of custom hardware for a solid installation and a detailed touch that takes the look over the top. You can choose to install an entire wall of accordion folding doors on the exterior of your building, or you can just install a few panels. Either way, you’re sure to enjoy the connection between your outdoor and indoor living spaces. Traditional doors work well enough, but they lack style and flair. With exterior folding doors, you can count on making a great impression, improving the value of your home, and getting a design that you’d be hard pressed to find anywhere else. Plus, every installation is customized to the exact job, which gives you peace of mind that the doors will always be functional and easy to operate.